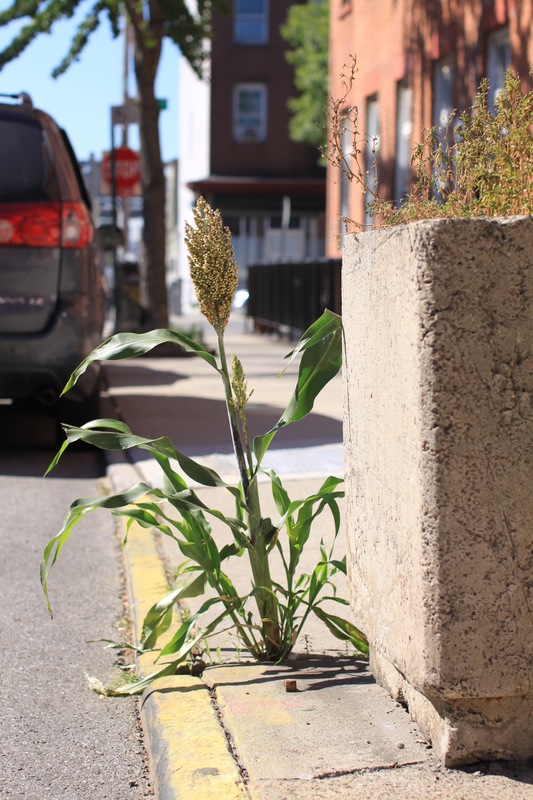 In July, a renegade stalk erupted from a crack in the sidewalk in Brooklyn. Some neighbors thought the stalk resembled corn at first. As the flower and seeds began to form it became clear that it wasn’t corn. My curiosity about this rebel plant brought to mind the book, My Amazing Poo Plant by Moya Simons. In this book, a girl waters bird droppings in an empty planter, only to have a plant grow. Now here I was marveling a plant in a sidewalk crack that had to be a bird’s “doing”. Sorry. Inspired by the book, I thought it might be a fun school’s-out science project to have my kids find some of the more interesting crack and poo plants in our area. Too my surprise, we’ve had a banner crap this year…I mean crop. And the best part of this project is you can go around your neighborhood yelling, ” LOOK KIDS! IT’S A CRACK PLANT!” Before you know it, your kids will be yelling it, and you will look like the best parent on the block. Here is what we found on our urban botany adventure. Observing the crack plant’s brush-like flower and small, white, circular seeds, we easily googled to identify the plant as Sorghum. Sorghum is a drought-resistant ancient grain with origins in North-Eastern Africa. It is thought to have come to the Americas on slave ships. Traditionally the sweet variety is made into syrup and the shorter variety is kept for livestock feed. In the past, Sorghum was not well known outside Kentucky and Tenessee, but it has become very popular in the gluten-free market, given it’s naturally gluten-free composition. A gluten-adverse grouse probably explains it’s growth in this particular crack. A bird foraged on a gluten-free sorghum morsel, digested it, and dropped it’s waste in a crack. Voilá Crack Sorghum! What’s the street value of crack sorghum? It’s free on Hoyt St. Otherwise, Bob’s Red Mill whole-grain sorghum can be found at Whole Foods and elsewhere in the the $3 range. The harder find, sorghum syrup, can be found at Oak and Salt, $12 for an 8oz bottle. In spite of the high cost, I briefly considered switching to sorghum syrup for pancakes until I learned that in spite of it’s nutrients, sorghum is actually higher in calories and less sweet than maple syrup. But wait! The coolest thing about Sorghum, is that the grains can be popped into something that resembles popcorn both in appearance and taste, but with more nutrients, so of course I tried it! It popped just like popcorn. It tastes just like popcorn. The only problem is the kernels are so tiny that eating it requires a spoon. For that reason, I don’t recommend it for kids in front of a movie. You’ll have a huge mess. I would, however, recommend including it in salads for crunch. Our next crack plant is more ornamental and surprisingly more nutritious than sorghum. You will find these in all manner of cracks including one of the hardest locations to grow vegetation in the city, the infamous tree-pit. You’ve got to be tough to survive a Brooklyn tree-pit. If the the tree roots aren’t swallowing every ounce of soil, urban pets are burning the foliage with their urine and waste. However, one plant doesn’t mind, Amaranth. Amaranth has burgundy stalks and leaves, and a flower that is a deep magenta seed cluster. It is also an invasive and sometimes herbicide resistant weed. What’s the street value? It’s free in a tree-pit near you. At about $0.35 per oz. you can pick up a 24oz. bag of Bob’s Red Mill whole-grain amaranth for a little over $8. Nutritionally, it is characterized as a pseudo-cereal like quinoa. Yes, it’s gluten-free and can be popped like sorghum, or made into salads. Native to Mexico, where the preference is to eat the seeds, the Conquistadors banned the Aztecs from cultivating Amaranth. The USDA estimates the seed to have 30% more protein than sorghum. Given it’s nutritional value and ease of cultivation, some believe it could be the crop of the future, particularly in the battle against obesity. In Asia, Africa, Greece, Trinidad and Jamaica, the leaves are prepared as a vegetable side-dish or used in stews and soups. However, there are varieties with toxic properties, so I wouldn’t start foraging for crack Amaranth. Say that five times fast! Every summer the cement petunias bloom. This is not a poo plant, as a bird would not be eating petunia seed pods. So how are these spreading? These petunias are everywhere and always seem to be the same shade of magenta. They make impressive clumps in random spots and people clearly show their preference by not removing them. It’s amazing to see an annual survive winter after winter under the concrete and seemingly “perennialize.” I have been wondering for a long time how these survived the winter. Still the cold we experience in Brooklyn should be enough to kill Purple Wave. How can this annual survive? I’ve got a theory. Before Kirin Brewery hybridized Franken-petunias to bloom all season and spread; petunias were actually tiny perennial flowers in South America. They are still perennial in southern climes. We northerners just associate them with annual flats that we purchase from garden centers in the spring. I think the key to its crack success is that this petunia is bred to spread. The root system must be extensive and insulated beneath the sidewalk causing the plant to survive year after year, protected by the concrete. 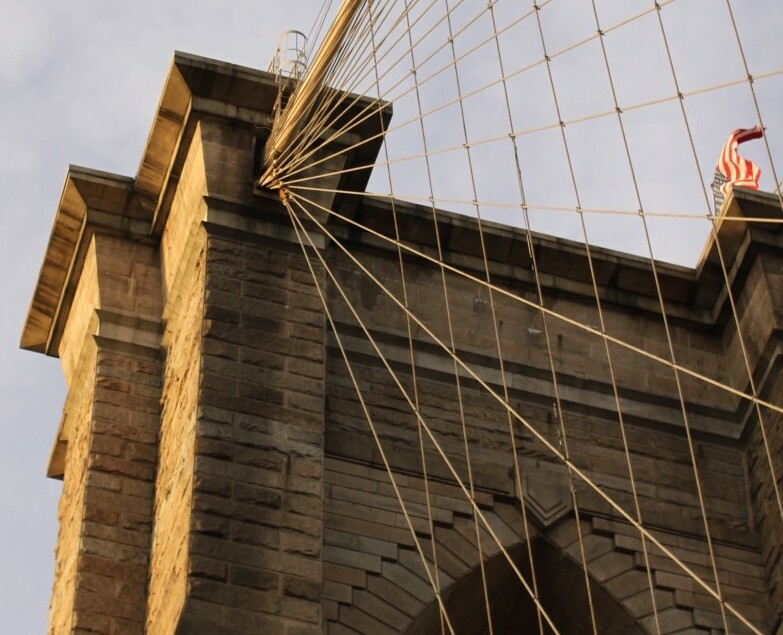 Also, remember New York City’s underground infrastructure is extensive. Aided by pockets of warm air created by underground subway systems, sewer systems, gas and electric systems and our own boiler-heated basements; the petunias’ roots may enjoy an underground micro-climate that prevents a deep freeze.